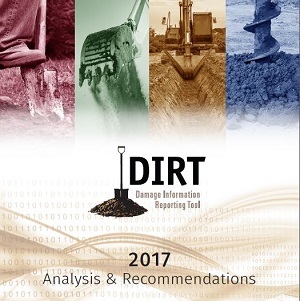 On September 19, CGA released the latest DIRT Report. The report is published annually and is based on data entered into the Damage Information Reporting Tool for a given year. For the fourth year in a row, the number of events submitted into DIRT increased, with more than 411,000 records submitted for 2017. Details on how an improved data analysis process was used to estimate the total U.S. damages for 2017 and generate revised estimates for 2015 and 2016. Estimated damages have increased year-over-year from 2015 to 2016 and 2016 to 2017, but when construction spending and outbound locate transmissions are considered, damage rates have effectively remained stable during this three-year span. Damages that occurred on a weekend were nearly twice as likely to involve hand tools (shovels, post-hole diggers, etc.) than those that occurred on a weekday. 50 percent of all reported damages occurred between June and September in 2017. August was the month with the most total damages in 2017. Access the full report and press release by clicking on the links below. In addition, CGA created a series of supporting infographics featuring key takeaways from the 2017 report.